The name, occurring in the Greek apocryphal writings, of a Persian province lying between Egypt and the Euphrates. In old editions it is given as "Celosyria." This name stands for the earlier expression "the, country beyond the river" (Ezra iv. 10, R. V.; compare I Esd. ii. 17, 24, 27, R. V., "Cœle-Syria and Phenicia"; ib. vi. 29, "tribute of Cœle-Syria and Phenicia"; and ib. vii. 1, "the governor of Cœle-Syria and Phenicia"). II Macc. iii. 5, 8 speaks also of a single governor for both Cœle-Syria and Phenicia under Antiochus Epiphanes, so that the old Persian administrative division must have been retained. The Greek term "Cœle-Syria" originally meant the valley between Lebanon and Anti-Lebanon, the modern Biḳa', called in the O. T. (Josh. xi. 17, xii. 7) "the valley of Lebanon." Greek writers extend that name vaguely and inconsistently to "the land from Seleucis [i.e., northern Syria] to Egypt" (Strabo, p. 756), or to central Syria with Palestine except Judea proper (Strabo, p. 750), or with all Palestine (thus Polybius, v. 80, 86; while v. 87, like the apocryphal writings, distinguishes Phenicia from Cœle-Syria). Josephus also varies in his use of the term, applying ("Ant. "xiv.40) "Cœle-Syria" to the valley, excluding Damascus, but (ib. xiii. 13, § 2 [Niese xii. 136]) including Palestine, cast of the Jordan (ib. xiv. 154), Galilee, and (ib. xiv. 79) extending it to the Euphrates (this passage is, however, corrected by Niese). 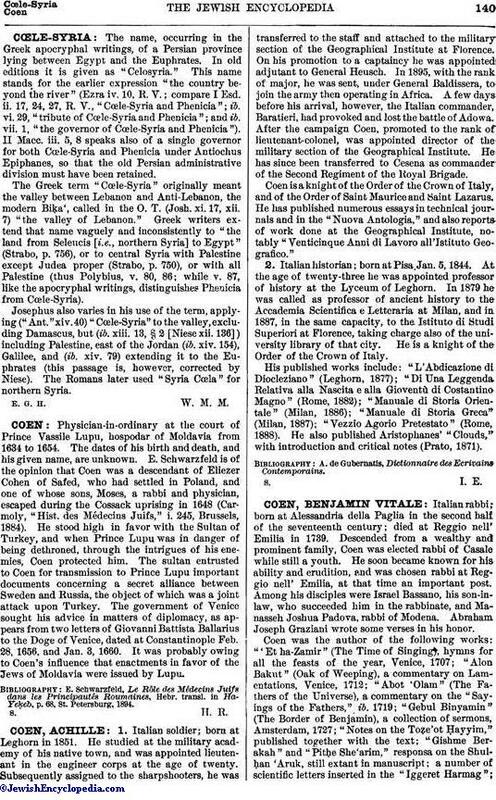 The Romans later used "Syria Cœla" for northern Syria.